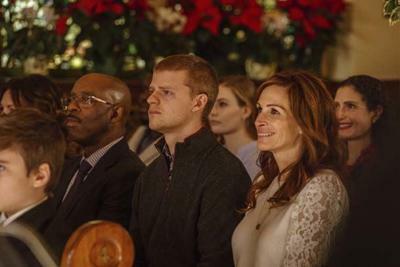 Ben Is Back, starring Julia Roberts and Lucas Hedge explores the catastrophic costs of addiction on one middle-class family in a powerful drama on drug abuse. Going by the poster of the movie-an image of a wayward son hugging his mother-one would assume it’s a happy tale of a family holiday. One would also assume it’s a big budget epic with big star cast of Julia Roberts and Lucas Hedge (the next big thing!). Only that it is not! It is actually an intimate, incredibly tense drama about a troubled family battling raw emotional pains, a bare-bones and bare-knuckled look at the destructive powers of addiction. Ben (Lucas), the title character, is a drug addict who comes home for Christmas from his rehab centre. His arrival is a surprise and not everyone at home are happy to see him. Mom Holly (Julia) is happy and struggles to put a happy spin on the visit. With a forced smile she gives her son a long hug, and when he gets busy with other members rushes to hide her jewellery and the drugs from medicine cabinet. Then she goes back to smiling and reassuring everyone that with Ben back, the family is going to have a warm holiday celebration, just like they used to. Two of Ben’s siblings, grade-schoolers, do not understand why their big brother has been gone for so long but their older sister Ivy (Kathryn Newton) makes her anger felt in each of her appearances. So does his step-father Neal (Courtney B. Vance) who suspects his step-son’s unannounced visit. As the drama unfolds telling us of the misery Ben inflicted upon his family in the past, he tries to comprehend the mixed reactions of his family. Wrestling with issues he admits that coming home for Christmas might have been a wonderful idea or the biggest mistake he’s ever made. And he’s made some really big mistakes. Peter Hedges successfully creates a sense of mystery around Ben that works to good effect. One thing is clear, however, his addiction led him to do some devastating things and there’s still a great deal of distrust about him. As a viewer, we keep guessing if he is genuinely contrite and serious about his rehab or he is a con who will exploit his family yet again to get money and drugs. Ben’s sly grins give us cause to doubt Ben’s faithfulness, but we’re never sure. That works to the movie’s benefit. The film loses its grip on the audience in the second half. Search for a missing dog takes on quasi-thriller characteristics. The well-crafted realism of Ben and Holly is spoilt by the artificial dialogues between them. One wonders if Peter Hedges thought the movie with some action sequences would become too dull and introspective. Much of the conversation between Holly and Ben comes like a writer’s construction rather than things a mother and son might say to one another in this situation. What Peter Hedges does manage is a well-balanced low-key performance from his son as Ben. Julia transforms well into the role of a mother and Kathryn Newton brings out the conflicting emotions of a teenager well. Ben is Back, in respect to the problems associated with addiction, doesn’t downplay the difficulty of recovery or the attempts to help by the too-eager family members. Just that some cumbersome elements distract us from the core human story. The manner with which it arrives at the ending leaves you raw and unnerved, and wanting to know more when the last frame fades to black.